Follow that Hare – combining the contemporary and traditional for The Mead Gallery. Autumn has finally crept up on a long hot summer and with it, a lovely autumnal commission for The Mead Gallery at Warwick Arts Centre at The University of Warwick. The gallery has recently acquired a new loan, ‘Acrobats’ by Barry Flanagan, an elongated bronze statue of two hares, precariously balancing on each other, standing tall in the beautifully landscaped grounds of the campus. In celebration, the ‘Follow that Hare’ project was created. 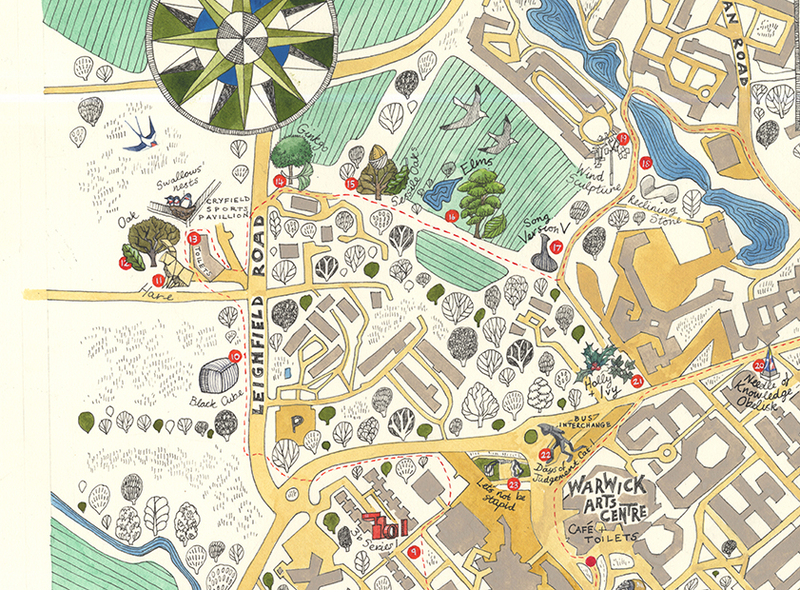 I was commissioned to create a new hand drawn map of the grounds guiding the visitor past the sculptures of the collection and taking in seasonal sights such as swallows’ nests and reddening oak trees. With it came an autumn field guide for children, full of nature facts and games; something that could be used by small explorers as part of the specially designed backpacks (which also include pairs of handy binoculars!). The map itself was an interesting piece to work on. I was told to base it on a wildlife map of Brighton, originally created for ONCA Gallery, using similar style and lettering. Unusually for me, this meant drawing in ink but colouring mainly with Photoshop which I’m really not used to – I figured that it would be useful chance to deepen my digital experience. Combining the hand drawn with such a recent creative tool made me think about how I could blend the traditional with the contemporary. 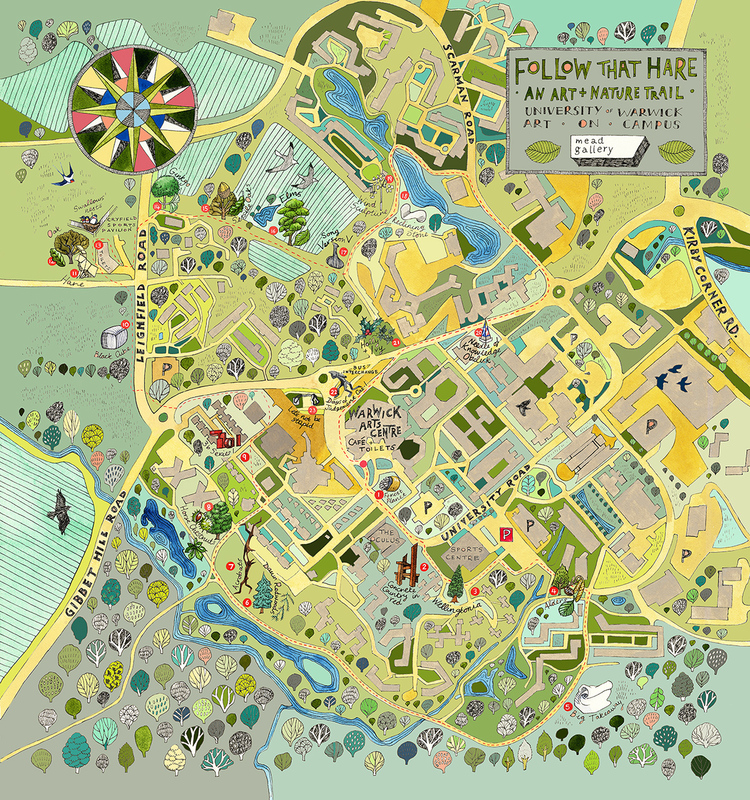 The map was entirely hand drawn with parts coloured by hand in ink and watercolour as you can see here. The rest was coloured using Photoshop. Spot the spelling mistake. Photoshop is also useful for making corrections. The map came in at slightly under A2 and I had to use multiple maps as reference because of the size and complexity of the building layout. Architecturally, the University of Warwick is an interesting institution. From above, buildings are blocky but with unexpected angles and shapes – complicated but great to utilise the strong geometrics as surface patterning. Part of my love of urban maps is the negative spaces and rhythms found between buildings and how their shapes can appear almost like contemporary abstract art. For me, the flat pixels of digital colouring add to this contemporary feel. The printed map and the folded version. 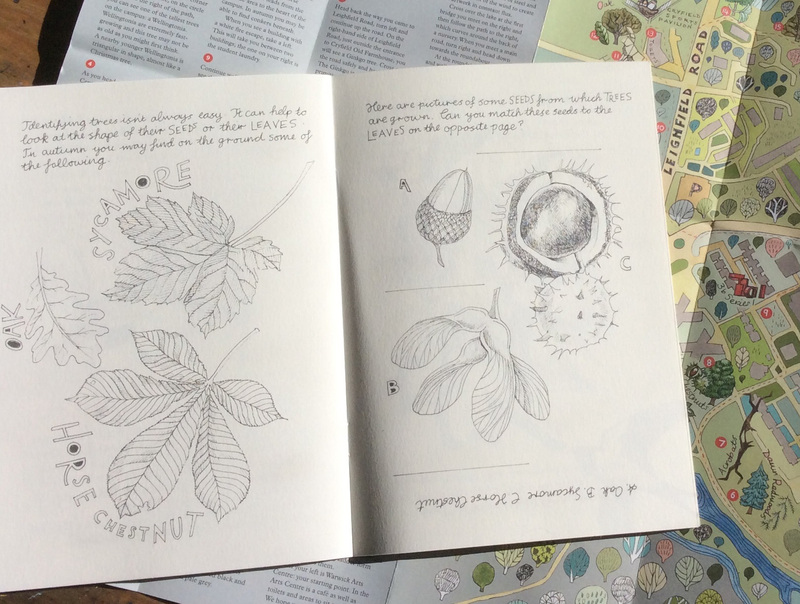 The autumn field guide is entirely hand drawn in black pen and ink without digital colouring but it echoes the map in it’s use of hand lettering. Titles; contemporary sans serif capitals, sometimes with openers filled in, are in a style I developed myself and use often. In contrast, the main body of the text – flowery, traditional and cursive – is based on Deutsche Normalschrift. I wanted the booklet to be contemporary but have a feel of an old nature journal, perhaps written and illustrated by some tweed clad gentleman of the ’20s, slightly damp and crawling through bushes after a rare mallard. As ever, I love drawing animals, plants and birds, so it was definitely a fun part of the commission. 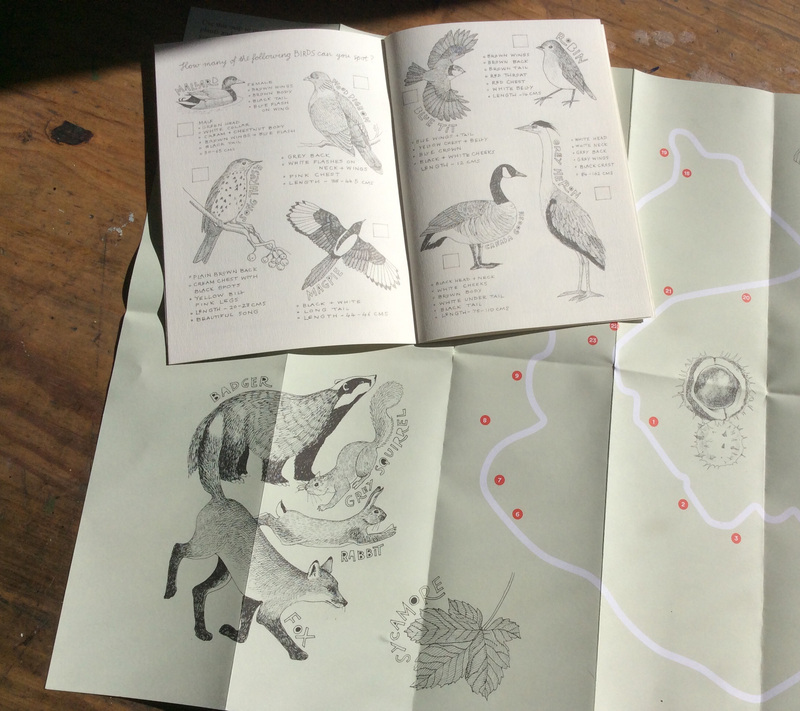 A double page of birds from the Autumn Nature Guide and the back of the map showing more illustrations from the book. A page of seeds from the Autumn Nature Guide showing the cursive style of the main body of the text. I’ve just received the map and guide in the post this morning but it was published in time for Freshers’ fair last week. Future talk involves using some of the design for hoardings and an information booth. Regardless, I think what’s important for me is that hopefully I managed to contrast the contemporary and traditional, the modern sculpture in steel and stone with the fading greens of the early autumn trees successfully. And as a further aside, I have a secret fantasy that perhaps some hungover student might have dragged themselves out of bed and taken themselves on a walk of art and nature one misty Warwickshire morning. Seckford Hall Hotel – editing stories on a map. 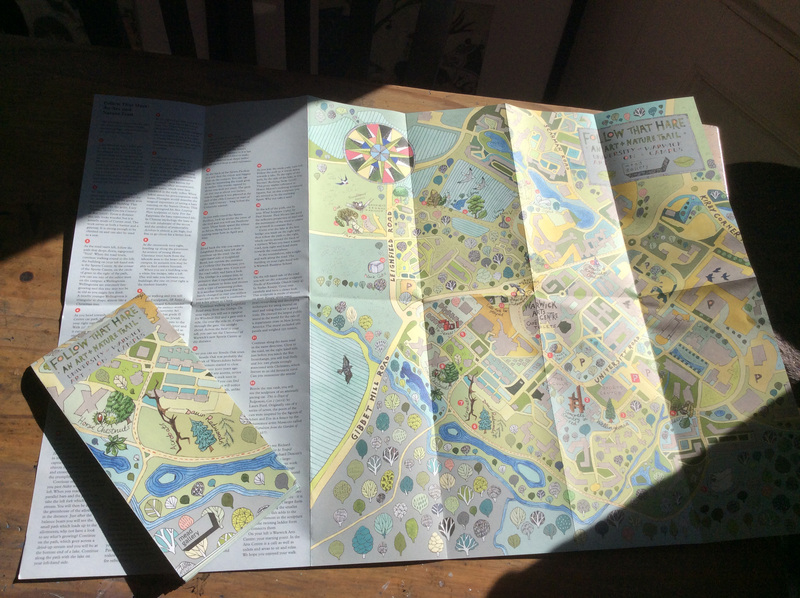 Growing Wild FM – talking on the radio about maps. Flying high with Ridley Scott – sketches for his Turkish Airlines commercial, ‘The Journey’.